In this Page, Students can download Rajasthan Board 12th Syllabus Blueprint for all subjects. AJMER Board 12th study materials includes Syllabus, Blueprint, Notes, one marks with answers, Previous year Question Papers, Model Question Papers for all subjects. Students can download RBSE 12th Study materials for Arts, Science, Commerce and Vocational. Students of Class XII can download RBSE 12th Syllabus for all subjects using below link. We have provided Rajasthan Class 12th Syllabus PDF for all Subjects. Download Rajasthan Board 12th Syllabus in Below link. Students of Class XII can download RBSE 12th Blueprint (Schemes & Exam Pattern) for all subjects using below link. We have provided Rajasthan Class 12th Blueprint PDF for all Subjects. Download Rajasthan Board 12th Blueprint in Below link. Students of Class 10th can download RBSE 12th Model Question Papers for all subjects using below link. We have provided Rajasthan Class 12th Sample Question Papers 2018 PDF for all Subjects. Download Rajasthan Board 12th Model test Papers in Below link. Students of Class 12th can download RBSE 12th Previous year Question Papers for all subjects using below link. We have provided Rajasthan Class 12th Previous year Question Papers 2018 PDF for all Subjects. 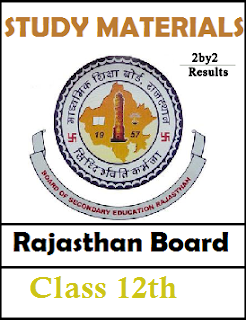 Download Rajasthan Board 12th Previous year Papers in Below link.